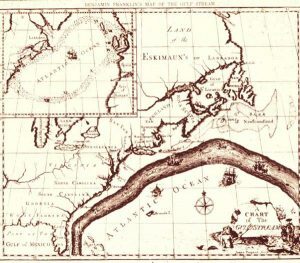 Benjamin Franklin provides a crude, but amazingly accurate rendition of the Gulf Stream for its time. Crossing the Gulf Stream where ocean currents can exceed 2 knots takes some skill and if you try in under certain weather conditions, could be dangerous for any size vessel. High wind and wave events can occur under certain conditions along the northern edge of warm, fast western boundary currents like the Gulf Stream off the US East Coast. Other areas with similar conditions include the Kuroshio Current near Japan and Taiwan, near the Agulhas Current along the east coast of South Africa and the East Australian Current off east coast of Australia. 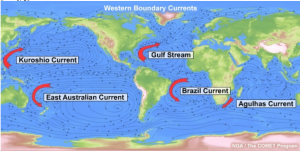 There is also the Brazil Current, however, this major warm ocean current has not been a major part of commercial shipping traffic compared to the other currents which may explain why there have been no known major weather impacts reported. Benjamin Franklin, in 1786 noted that “vessels were “sometimes retarded and sometimes forwarded in their voyages by currents at sea”. He knew that ships coming from Falmouth to New York took a fortnight longer than those coming from London to Rhode Island. Franklin consulted a Nantucket sea captain regarding this and was told that the cause was the Gulf Stream. (Nantucket captains knew of the Gulf Stream because of the whaling trade.) That same captain marked the stream on a chart along with directions for avoiding it. During the winter months, when extremely cold air moves off the US East Coast and flows over the very warm waters of the Gulf Stream, unusually large waves can develop along the northern and western boundary of the stream. These events produce waves that are larger than one would expect for a given wind force and fetch. These conditions can present severe hazards to marine operations, especially to smaller vessels. In fact, there is documentation of waves being up to five (5) times the expected significant wave height values, as driven by higher winds. For example, gale force winds (34-47 knots) and higher, will generate, at a minimum, waves higher than 20 feet, and in addition, rogue waves have also been reported on occasion due to wave-current interactions. A decrease in friction as the wind moves offshore. Destabilization of the marine boundary layer (MBL) as cold air moves over warm water (especially, if there is a 20-degree difference in temperature (Fahrenheit) between air and the Gulf Stream surface. During the winter, as arctic air moves offshore, the shallow cold air becomes unstable, especially over warm currents such as the Kuroshio of the Western North Pacific or the Gulf Stream of the Western North Atlantic. The resulting strong vertical transfer of heat destabilizes and deepens the atmospheric boundary layer and the resulting de-stabilization allows high wind momentum to mix down to the surface. Ocean waves build quickly in response. 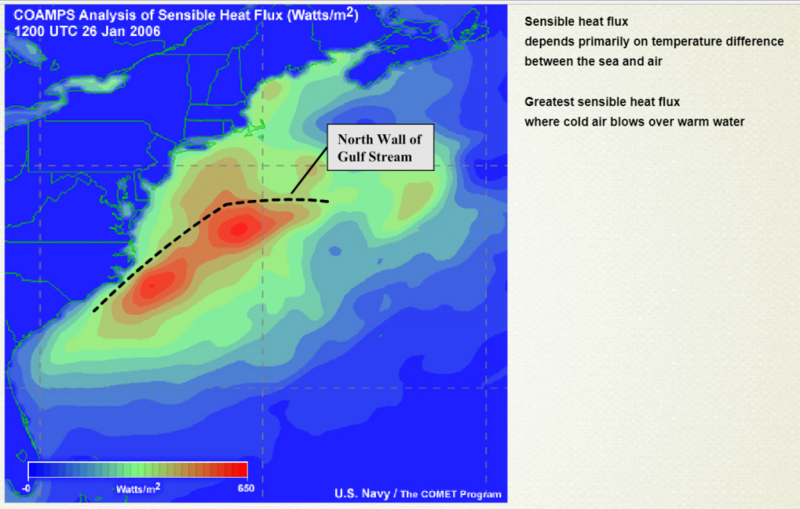 The COAMPS image above highlights the sensible temperature differential of Sensible Heat Flux with the ocean temperatures which becomes exacerbated with the infusion of cold air above. The illustration above depicts the stylized circulation in a shallow vertical scenario when cold air interacts with warmer ocean surface. The synoptic situation for this scenario would be strong low pressure to the east of the Gulf Stream and high pressure to the west, setting up a NW wind flow which would cross the stream at a 90-degree angle to the NE set of the Gulf Stream (current’s direction of movement). 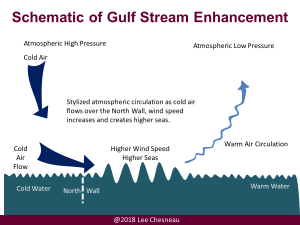 Another scenario is when wind opposes the current, especially in fall, winter and spring when we have strong temperature differences between the air above and the Gulf Stream below. Recent cruise ships have reported encountering winds of up to 127 knots which was doubled what was forecast. The GOES-12 visible picture above at 26/1915z shows a pronounced area of cloud free skies along the coast of VA-NC-SC associated with cold / dry air moving offshore from the NW. As the air moves further offshore, “clouds streets” begin to form, oriented parallel to the wind flow. 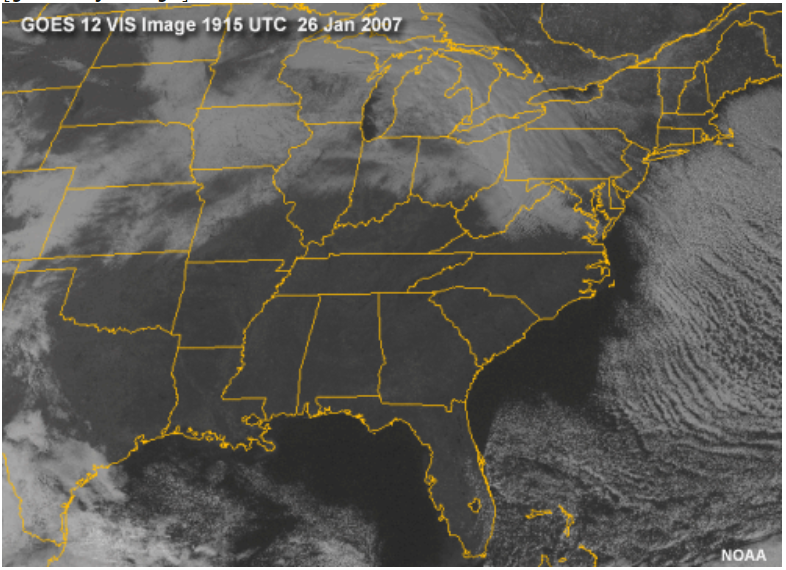 Note the closeness of the clouds streets indicates the strength of the winds. 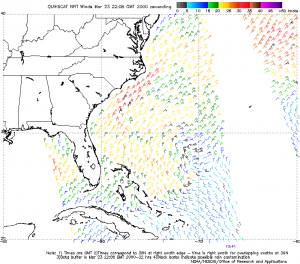 To the right is a QuikSCAT image in a September scenario that depicts enhancement of higher winds blowing counter to the Gulf Stream (from the NE) that is 15-20 knots outside of the Gulf Stream compared to 30-35 knots inside the stream). The temperature differences are not as great as perhaps in the November through March months, when wind speeds can be significantly higher. 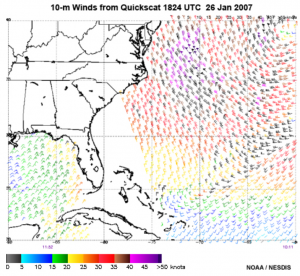 To the left is a composite QuikSCAT imagery taken in January showing an area of strong winds exceeding 35 knots over and south of the North Wall of the Gulf Stream. (The highest reported wind was 55 knots.) The black barbs indicate areas of possible rain contamination. However, very little rain was noted in this area, but banded street clouds were observed. It should be noted again in this scenario; the winds are blowing from the NW or at a perpendicular of 90-degree direction to the “set” of the Gulf Stream. When ocean wind or swell waves encounter a current moving in the opposite direction, the response will be for wave speed and length to decrease, wave period will not change, but wave heights will increase, resulting in taller, steeper waves. In some cases, this can even lead to waves breaking, resulting in greater energy against hulls. This type of event can occur in all seasons and may or may not be associated with the cold air outbreaks mentioned above. The region around the Agulhas Current is particularly prone to high waves resulting from this type of wind opposing wave-current interaction. When swell that originates elsewhere encounters a current, its wavelength and height change. When the current is flowing in the same direction as wave travel, wavelength increases while wave height decreases. Where currents oppose waves, wavelengths decrease, and wave heights increase. Ocean current eddies can cause large variations in the wave height and period, because they contain both counter currents and following currents with respect to the waves over relatively short distances. 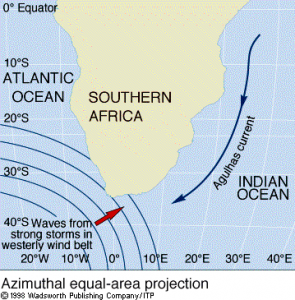 The illustration to the left, is typical of the influence of the southern hemisphere’s roaring 40s and screaming 50s impact on the Agulhas Current. The thermal satellite image to the right is a depiction of the Gulf Stream and its eddies allowing one to see the dramatic temperature contrasts in temperature between the continental shelf waters to the north and the adjoining Sargasso Sea to the south. Because waves slow when they encounter an opposing current, they also refract. Just as bends in the coastline concentrate or diffuse wave energy, bends and meanders in ocean currents similarly concentrate and diffuse wave energy. Wave refraction is one possible origin for rogue waves. Wave-current interactions increase exponentially as the current speed increases. This effect becomes significant when currents reach speeds of 1-1.5 knots. 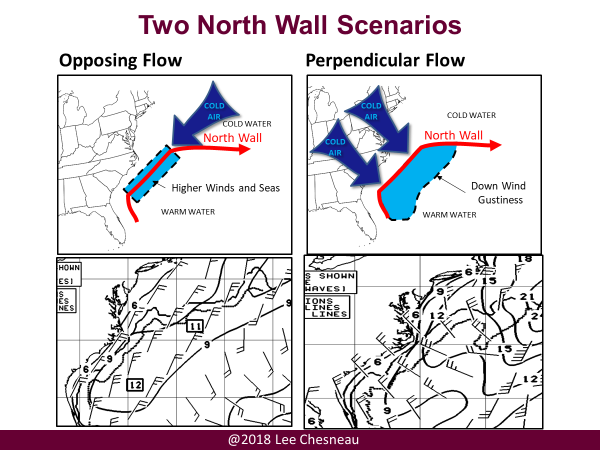 The figure below depicts two North Wall scenarios; wind against current and wind flow perpendicular to the axis of the Gulf Stream. When crossing a boundary current like the Gulf Stream mariners must be aware of the wind and sea forecast before departure and while underway. If wind waves or swell are opposing the set of the current or if arctic air is streaming offshore at right angles to the current a mariner should anticipate a risk for encountering wave heights from 40% to 100% higher than the general forecast values near the north wall of the current and also crossing eddies. This entry was posted in Meteorology, Weather Routing, Weather Wisdom and tagged Boundary Currents, Crossing the Gulf Stream, Gulf Stream, High Wind, North Wall Events, Ocean Waves, Rouge Waves, Wave height, Weather Routing, Weather Wisdom. Bookmark the permalink.